On Friday 5 February we will be joined by world renowned Jewish educator, Dr Hanan Alexander. Following Kiddush on Saturday 6 February, Dr Alexander will address the community on “What is Jewish about Jewish Education”. The service begins at 10am. 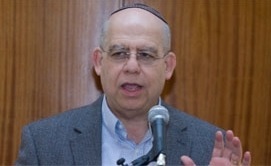 Hanan Alexander is Dean of Students and Professor of Philosophy of Education at the University of Haifa, where he heads the International School and the Center for Jewish Education. A past head of Haifa’s Department of Education, he is also a Senior Research Fellow in the Van Leer Jerusalem Institute. His research interests include political, moral, spiritual, religious, and Jewish education and the philosophy of social research. Educated at UCLA, Stanford, and the Jewish Theological Seminary, Alexander has taught philosophy and educational studies at the American Jewish University, where he was Academic Vice President; UCLA; the Graduate Theological Union, Berkeley; the Jewish Theological Seminary, New York; and Bar Ilan University, Israel. He also served as Editor of the journal Religious Education, Richard and Rhoda Goldman Visiting Professor at the University of California, Berkeley, and Visiting Fellow at St. Edmund’s College and the Faculty of Divinity, University of Cambridge, UK. Alexander has published more than 125 essays in various academic and professional venues, a number of which have been translated into German, Dutch, Chinese, and Hebrew. His books include Reclaiming Goodness: Education and the Spiritual Quest (University of Notre Dame Press, 2001), which won a 2002 National Jewish Book Award, Ethics and Spirituality in Education: Philosophical, Theological, and Radical Perspectives (Sussex, 2004), Citizenship Education and Social Conflict: Israeli Political Education in Global Perspective, with Halleli Pinson and Yossi Yonah (Routledge, 2011) and Commitment, Character, and Citizenship: Religious Schooling in Liberal Democracy, with Ayman Agbaria (Routledge, 2012). His new book, Reimagining Liberal Education: Affiliation and Inquiry in Democratic Schooling, which was published by Bloomsbury in 2015, was recently nominated for a National Jewish Book Award.